It wouldn’t be an exaggeration to say this is the most difficult recipe I’ve ever written about. I have tested it literally 50 times over the course of three years, and my family has eaten hundreds of mediocre flatbreads as I attempted to crack the secret to perfect, bubbly lahoh — and this after I’d been taught by a professional Yemenite baker. 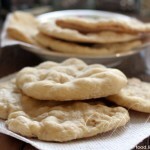 Lahoh is one of several varieties of Yemenite breads found in Israel. It has a spongy texture, much like Ethiopian injera bread, and is best described as a pancake cooked without being flipped. Some people have described them as similar to a crumpet. Like any traditional food, there are countless ways to make lahoh. Every modern baker I know makes it in a frying pan. Yet one friend of mine, an accomplished baker in her own right, said she never thought to make it herself because her grandmother would always make it on the backyard taboun oven that my friend’s great-grandparents brought over from Yemen. Plus, every professional lahoh baker has a slightly different trick in order to give lahoh its “eyes” — the bubbles that make up its surface. One baker said her secret was a cooked flour paste she added to the batter, I’ve heard of other recipes that call for breadcrumbs, and the first lahoh recipe I ever made — from my then-roommate’s grandmother — called for a very untraditional addition, baking powder. And then there’s the mysterious “red” lahoh, made from red sorghum. That, too is a traditional dish for some families, though I’ve never seen it being sold. Making lahoh can be a dramatic process to watch. The Yemenite bakeries I know in Tel Aviv generally have several pans of lahoh going at once on a row of gas burners, in order to produce a significant quantity. After a lahoh leaves the pan, the red-hot pan is held under a faucet or dipped into a bucket in order to cool it off for the next lahoh, creating a large burst of steam and an angry hiss. Then the batter is poured into the pan, the pan is shaken to disperse the contents and back onto the flame it goes. My lahoh recipe is based on one I learned from my friend Irit, who runs an itty bitty restaurant in Tel Aviv’s Yemenite Quarter. Irit had the patience to explain and show me time and again how she makes her lahoh, and as she is a generous woman who gives out recipes freely, I daresay I’ve seen versions of her recipe reprinted in multiple places. Yet if someone could make perfect lahoh merely from reading that laconic recipe, then he must be a better baker than I, as it took me close to three years to crack the secret and make consistently good lahoh at home, without Irit standing over my shoulder. 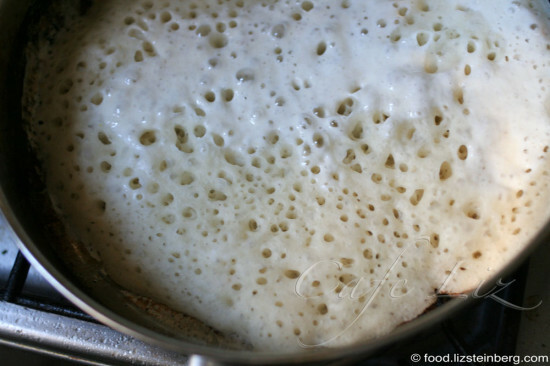 This lahoh is made from a simple batter — the only leavening agent is yeast, and a touch of flavor comes from ground fenugreek. What makes it so difficult is that you have to have a feel for the process — when to add a bit more water to the batter, when to let the batter sit another 10 minutes, when to lower the flame. Ultimately, this makes it very hard to document. And many, many things can go wrong — the lahoh can stick to the pan (what a mess), it can turn out too thin, or it simply can come out with no “eyes” on top. Hopefully, though I’ll be able to provide detailed enough directions to save most you those 50 failed attempts. 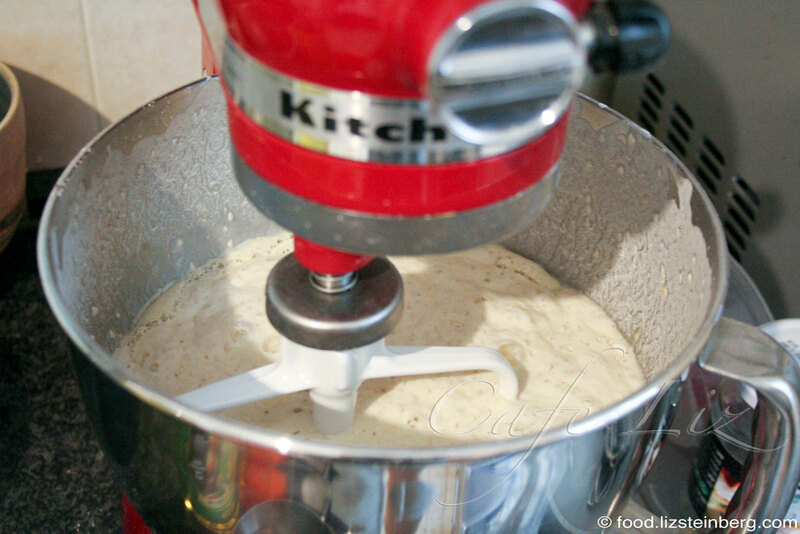 For me, the breakthrough moment came when I started using my Kitchenaid mixer to mix the dough. 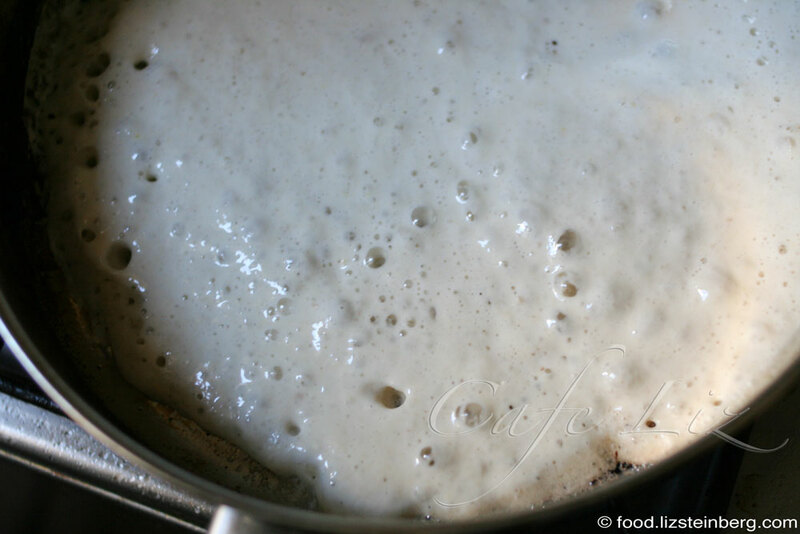 An untraditional step, to be sure, but this is an indication that mixing the batter well and enabling small bubbles to disperse throughout is crucial to your lahoh success. Note: Detailed photos follow after the written directions. Put the flour, salt, yeast and fenugreek into the bowl of a mixer, add 3 3/4 cups water, and mix thoroughly until there are no lumps. Alternately, this can be done by hand. 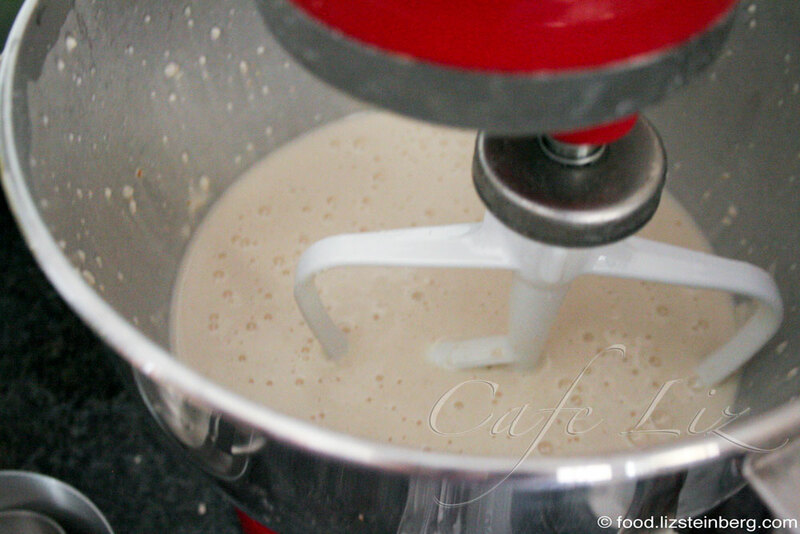 Cover the batter and let rise until approximately doubled in volume. It should look bubbly and frothy on top once risen. This could take anywhere from 1 hour to several hours, depending on the temperature. The batter, now bubbly, will be gelatinous in texture and not free-flowing. 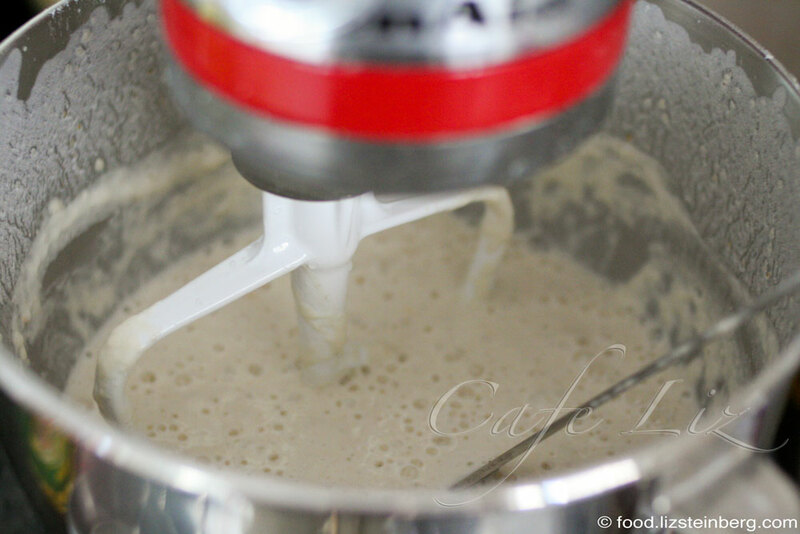 Pour the final 1/4 cup water into the batter, and give several thorough stirs — it should be more free-flowing thanks in part to the extra water, but you don’t want to beat out the bubbles altogether, since they’re responsible for giving the lahoh its texture. If using a stand mixer, turn on the mixer for no more than 10 seconds. 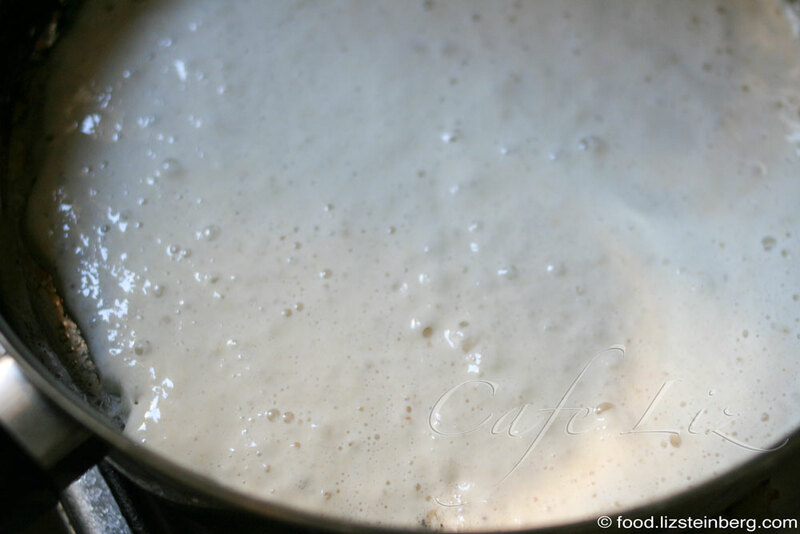 Let sit for another 15 minutes so that the batter rises a bit more. This isn’t 100% necessary, but I found it often gives me better results in case I overworked the batter in the previous step. 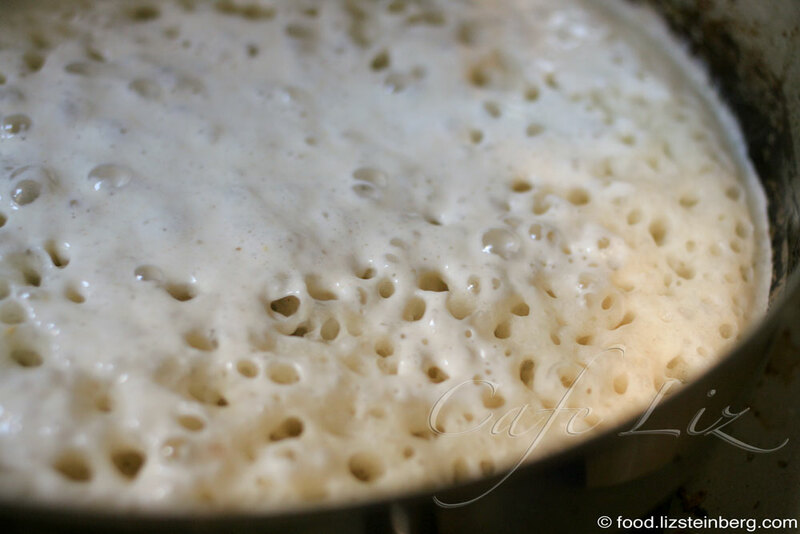 By the time you start cooking the lahoh, the batter should appear full of tiny little bubbles. Put your pan on a high flame. 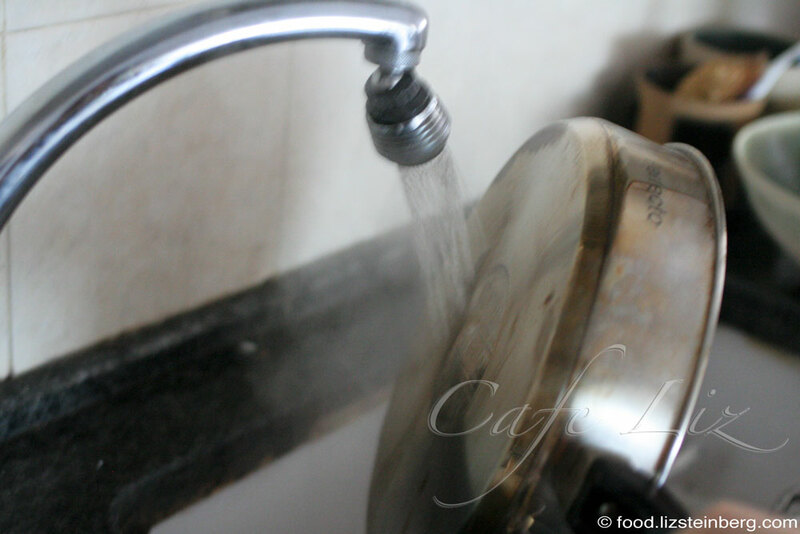 When a few drops of water flicked into the pan ball up and dance on the metal surface, you’re ready to go. Remove the pan from the flame and hold the bottom of the pan under a stream of water for several seconds, until the steam and sizzling is less violent (don’t get water into the pan itself — just onto the bottom side). Alternately, you could use a bucket of water to cool the bottom of the pan between lahoh. If you don’t cool the pan, the lahoh will start cooking too quickly and the bottom surface will be full of bubbles as well. Wipe the inside of the somewhat-cooler pan with the stick of margarine (you could use an oil-soaked paper towel instead, but I’ve had less luck with that). Pour two ladles (or one 12-ounce/360-ml cup) of batter into the pan, trying your best to distribute the batter while pouring. Give the pan a few shakes so that the batter covers the surface — the batter will still have a somewhat gelatinous texture and not be entirely free-flowing — and return the pan to the flame. Adjust the flame to medium-high (I use a medium setting of the largest burner on my gas stove). Bubbles should start appearing rather quickly on the surface of the lahoh, and they should mostly stay there as the lahoh’s top dries out. The lahoh should be on the flame for a total of 3 1/2 to 4 minutes, long enough for the entire top surface to cook and then some. If you smell the bottom of the lahoh burning, turn down the flame a bit. 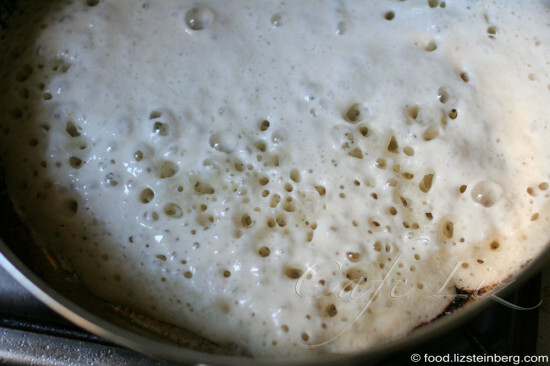 If the surface of the lahoh does not develop a nice amount of bubbles, try letting the batter sit for another 10-15 minutes before making the next lahoh. Remove the lahoh to a paper towel to cool — the paper towel absorbs excess moisture. Repeat the process, from the point where the pan is cooled under running water or in a bucket. There should be enough batter for a total of 6 lahoh. To store, the lahoh can be stacked with the bubbly sides facing each other and kept in a plastic bag in the fridge. This particular lahoh spent about 3 1/2 minutes in the pan, enough for the top to dry entirely and the bottom to brown slightly. 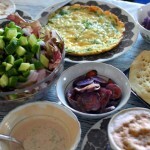 7 Responses to "Making lahoh like a professional Yemenite baker"
Beautiful! 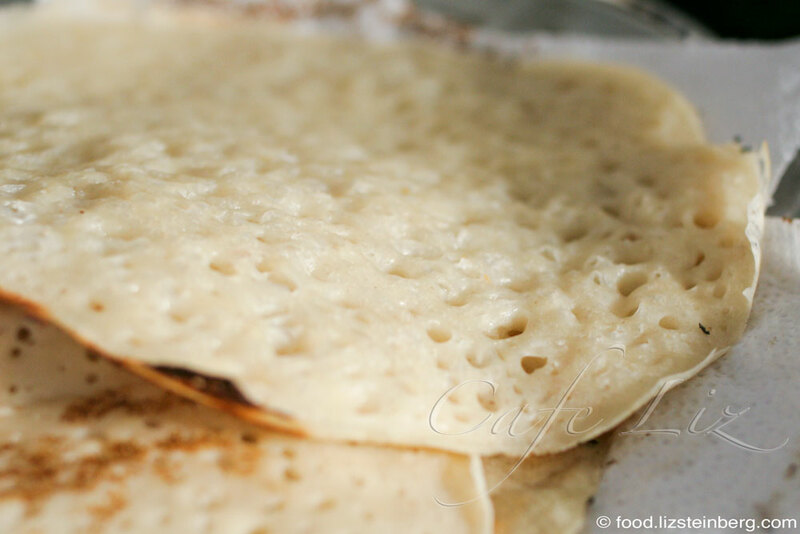 Similar to a fermented dosa. The fenugreek helps with the fermentation. I never knew about the fenugreek. I love lahoh but hate fenugreek – wonder why I’ve never detected the taste in lahoh. Anyway, thank you for this very detailed description. That’s dedication. Congratulations for cracking the lahoh code! It’s hard to get right- I’ve tried many times. The day I finally made perfect lahoh, I was so excited I forgot to write down the exact proportions I used 🙂 Need to practice again.. These aren’t sour at all, right? But aren’t lahoh supposed to be a bit sour (kinda like injera)? Hi JMK, these lahoh are not sour, and no lahoh that I’ve ever eaten has been sour. But I wouldn’t be surprised if there are recipes for sour lahoh out there. In Yemen in particular there are lots of variations on lahoh, probably more so than in Israel. Have you had sour lahoh? 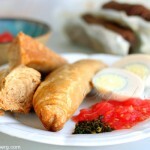 Can you share the name of the Yemenite bakery and also your friend’s restaurant? Thanks!